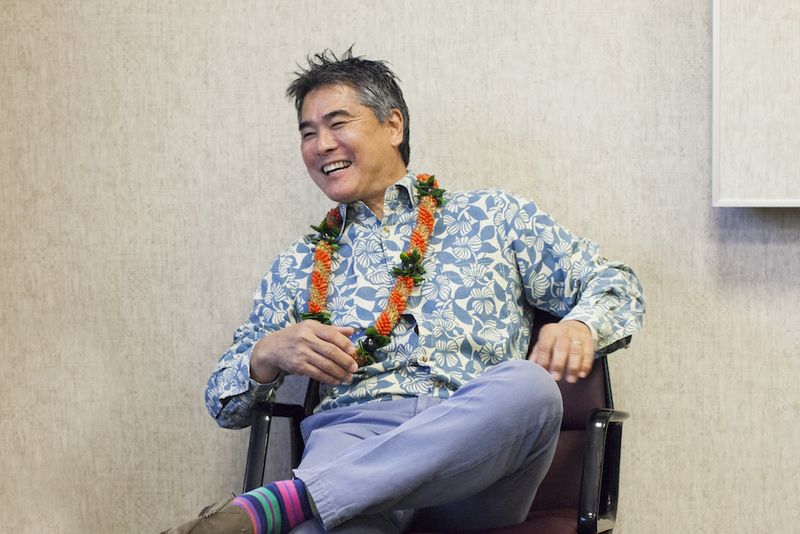 Chef Roy Yamaguchi didn’t single-handedly transform Hawaiian food into a world-class cuisine, but his high-end chain of Roy’s restaurants certainly helped broaden the culinary conversation. His most recent effort, Eating House 1849, with locations on Oahu and Kauai, follows a farm-to-table concept and pays tribute to his grandfather, who owned and operated a restaurant and tavern on the island of Maui. Before joining a Zócalo/Smithsonian “What It Means to Be American” panel entitled “What Role Will Hawaii Play in the Pacific Century?” he talked in the Zócalo green room about his so-so drum skills, his lhasa apso’s Instagram, and why he has a soft spot for Teenage Mutant Ninja Turtles. What’s the first dish you ever created in the “Hawaiian fusion” style? Napa cabbage, blanched and filled with lots of fresh oysters and some shallots—stuffed like a pierogi—cooked in white wine with more shallots, then sea urchin and beurre blanc added in. The cabbage got fully cooked and the flavor of the sea urchin went into the whole thing. What vegetable best describes you? No one’s ever asked me that question! One thing’s for sure, I’m not a bitter melon. I like to think I’m more sweet and stylish, maybe peppery. Like a shishito pepper. It could be sweet, could be neutral, could be spicy. You don’t really know what you’re getting, but in the end you like it. What was the first record album you ever bought? Probably something by Led Zeppelin. Rumor has it you’re a fan of the B-52’s. What’s your favorite song? I consider my life to be, not on vacation, but I love what I do. I personally don’t think I really get stressed. I look at stress as a state of mind and I’m pretty well balanced. I just enjoy spending time with family and friends, and boozing it up a little in between. Your lhasa apso, Mika, has her own Instagram. What inspired you to do that? It was my wife, Denise, who put that all together. I just got back from New York a couple of hours ago and my wife picked me up from the airport. She had Mika with her and I held Mika while Denise drove. Let’s put it this way: I wish I had drumming talent. I’m not a great drummer, but I do play drums. What kind of super power do Ninja Turtles have? They’re cool, they’re liked by a lot of kids, and they tend to make little kids happy. I’d like a super power like that. First I wanted to be a rock star—a drummer. That was my number one dream. Then a racecar driver, that was number two. Number three was I wanted to work with electronics. Then a friend of mine convinced me to take home economics, and that’s how my career with food began. My dad used to always tell me to work hard. He was a very, very hard worker, but he also played hard—he had a good balance. Working hard has been the best advice. It really formed me.